K2 Kitchens and K2 Design Group open the doors to its 2,000 sq.ft. kitchen showroom for a culinary battle between Bonita’s top chefs to benefit the Center for the Arts Youth Education Programs. Join us for inspired creativity and a little friendly competition, as four local chefs are challenged to create a dish incorporating a basket of “mystery items”. With guest judges and audience voting, it is up to the attendees to decide who takes home the trophy as the battle begins at 7! View featured art by some of the children while you enjoy wine and signature dishes by each of the chefs and bid on your favorite auction item during our Silent Auction starting at 6PM. Be there Thursday, April 20th, 6-9pm and find out who can stand the heat of the kitchen! Proceeds benefit the Center for the Arts Youth Education Programs, providing art, music, theater and dance to thousands of local kids throughout the year. There is no secret that today’s super heroes are seen on TV as characters with super strength, laser vision, that can fly and even leap tall buildings with a single bound, but we never see a super hero with the best super power… The power of Volunteering!!! 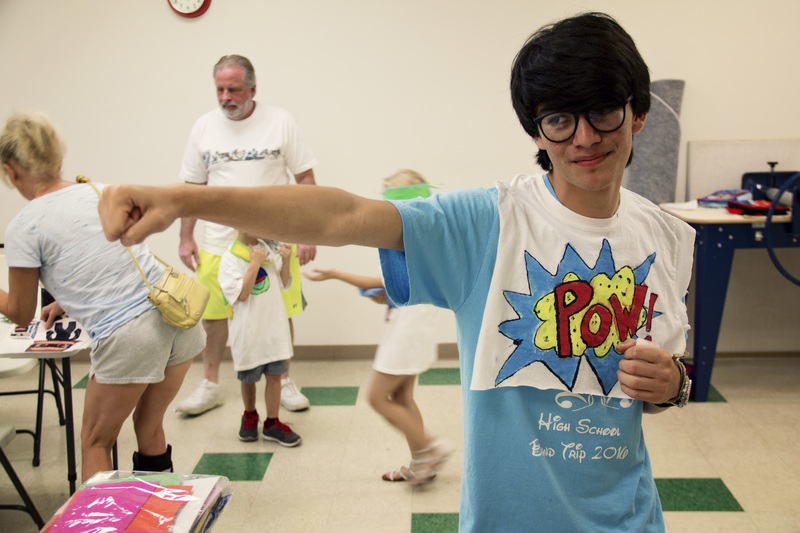 Yes, volunteering is in fact a super power and here at the Centesr for the Arts we have a league of super heroes using their super powers every day. They use it to help our staff with daily tasks that have to be done in a flash, they help with stage and lighting production with amazing strength and precision. They help our instructors with super hearing and anticipating all the little summer camper’s wants and needs. Yes, being a volunteer for the Centers for the Arts is a SUPER and POWerful way to dedicate your time. Volunteering promotes positive leadership skills for our teen volunteers, offering everyone the opportunity to learn amazing new skills, and get the chance to make a difference in our community and in doing so, inspire others to also volunteer. So, if you want to be seen as a community super hero, consider volunteering at the Centers for the Arts Bonita Springs. For more information on becoming a volunteer and other CFABS community events, please visit www.artcenterbonita.org. Visual Arts Center – 26100 Old 41 Rd. The Centers for the Arts Bonita Springs (CFABS) are poised to make this a summer to remember for hundreds of local youth with art, dance, theater and music Summer Camps that begin June 8 and run through August 12, 2016. 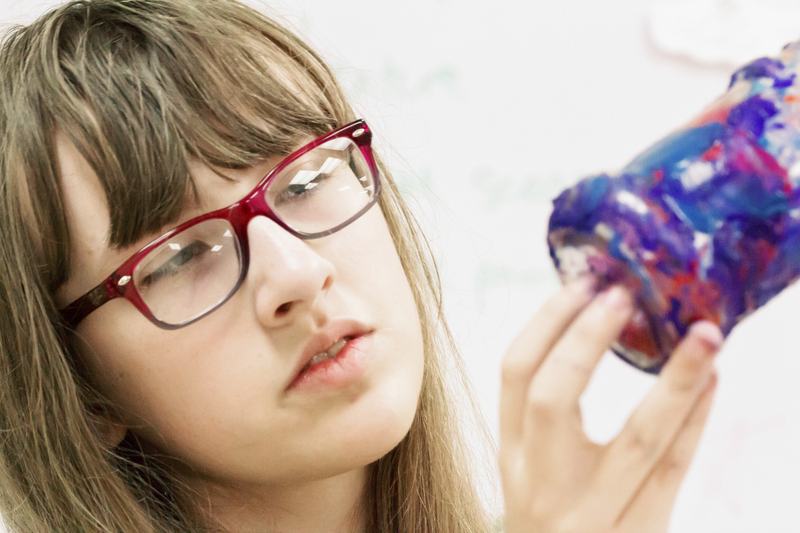 Full and half-day, week-long camps offer opportunities for students to attend one or more their 130 creative camp offerings for children ages 4 and up. Small age specific camp classes of 15 students or less provide opportunities for children to explore classes that include “Ready Set Sew,” “Intro to Acting,” “Cookonomics,” “Wheel Throwing,” “Graffiti Art” and many more. CFABS mission is to provide affordable opportunities to experience the arts and offer generous scholarships and discounts to families so children can enjoy a summer full of art. Families with young children can chose a themed “Young at Art” class. Designed for children four to five years old, “Young at Art” opens up an art and craft closet full of activities including singing, movement, storytelling, art, crafts and game playing. There is something new each day your child arrives at camp, making drop-off a tearless experience. Your child’s summer will be alive with the sound of music when they audition for CFABS Free Youth Theater production of “The Sound of Music Jr.” The production is open to children ages eight and up and there is no cost to participate. Auditions are being held June 7 & 8 from 4:00-7:00pm and can be scheduled by calling 239-495-8989. Performances are August 19-21. Morning classes run from 9:00am to noon and afternoon classes start at 1:00pm and end at 4:00pm. There are classes designed to inspire and engage budding artists as young as four years old and classes challenging and interesting enough to inspire teens. The Center’s summer art camps are designed so that families can choose just a 3-hour morning class for their child to attend while running errands or for working parents and those looking for a full day of enrichment for their children, morning and afternoon classes are offered with a supervised lunch in the middle for an additional $15. You can also drop your camper off as early as 8:00am or take advantage of the after-camp that includes games, drawing and videos in a supervised setting up until 5:30pm. After camp cost is $25 per week. Stop by the Centers for the Arts of Bonita Springs and pick up a catalog or go on-line to www.artcenterbonita.org for a listing of classes for children and adults. Great scholarships are available. Those who join the Centers for the Arts for the first time as an individual member receive a free 4-, 5-, or 6- week class (includes Summer Camp Classes), and those who join for the first time as a family member receive a free 4-, 5-, or 6- week class and two free tickets to a Live! performance. The Centers for the Arts offers this benefit for first time members and it is for a limited time only. The class and performance must be used before December 31, 2016. PRICE: Varies per session. Great discount and scholarships are available. Two mallards untangle from each other and explode into flight. A grizzly bear claims a salmon from a stream and warns with his eyes that this is a meal he is not sharing. Stallions display their superiority to rival onlookers as a four foot tall swine sits appearing to be in “hog heaven.” Those are just four of the 45 sculptures on display at SANDY SCOTT: A RETROSPECTIVE Exhibition on display at the Center for Visual Arts Bonita Springs October 2 through December 31, 2015. This national exhibition which also includes 35 of her etchings and drawings, opens in conjunction with a campus wide open house on Friday, October 2, 2015; 6:00-8:00pm. 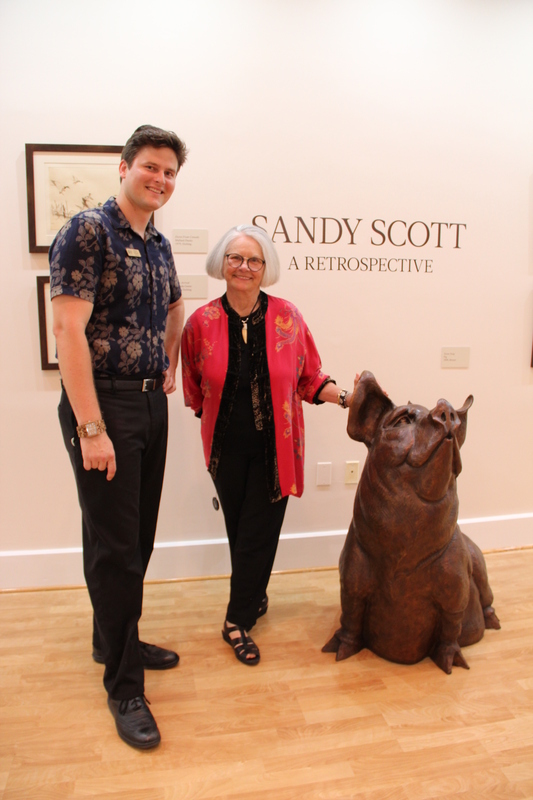 Guest s will have an opportunity to meet the artist Sandy Scott at the opening reception. 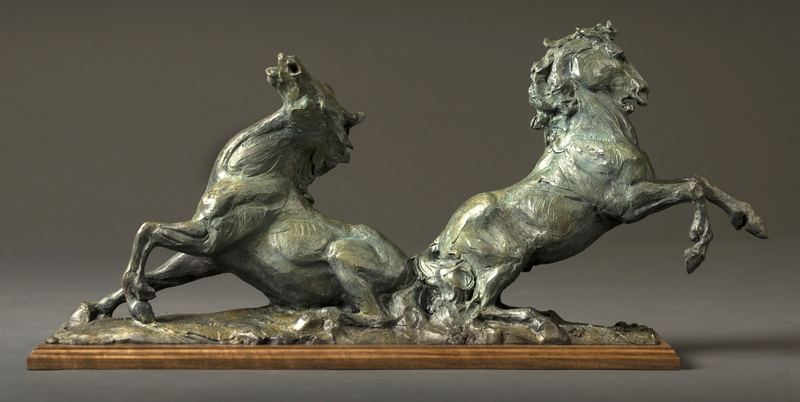 Born in Dubuque, Iowa in 1943 and raised in Tulsa, Oklahoma, Sandy Scott currently works in Lander, Wyoming in a studio near the foundry that casts her bronzes. Scott maintains studios on Lake of the Woods, Ontario, Canada, and in the mountains of northern Colorado and is an avid outdoorswoman who loves to hunt and fish. Scott has made 16 trips to Alaska and to Europe, Russia, China, South America, and Africa to visit the world’s great museums. She believes wildlife artists should be in the field to accurately present their subject to the viewer. A lifelong interest in aviation has been invaluable to Scott’s work as an artist. A licensed pilot for 50 years, she says, “I believe my knowledge of aerodynamics has been helpful in achieving the illusion of movement in my bird sculptures,” said Scott. Her knowledge of aerodynamics was particularly evident in Mallard Duet, a sold out sculpture that won the Ellen P. Speyer Award at the National Academy of Design in New York. This sculpture is in the permanent collection of Brookgreen Gardens and the National Museum of Wildlife Art. Sandy Scott is on the teaching staff of the Scottsdale Artists’ School, and the master sculpture workshops at Brookgreen Gardens, Murrells Inlet, South Carolina. She is a member of The National Arts Club New York, NY, the Society of Animal Artists, a fellow in the American Artists Professional League, and a fellow of the National Sculpture Society. Meet the artist at the opening reception on Friday, October 2, 2015; 6:00-9:00pm. 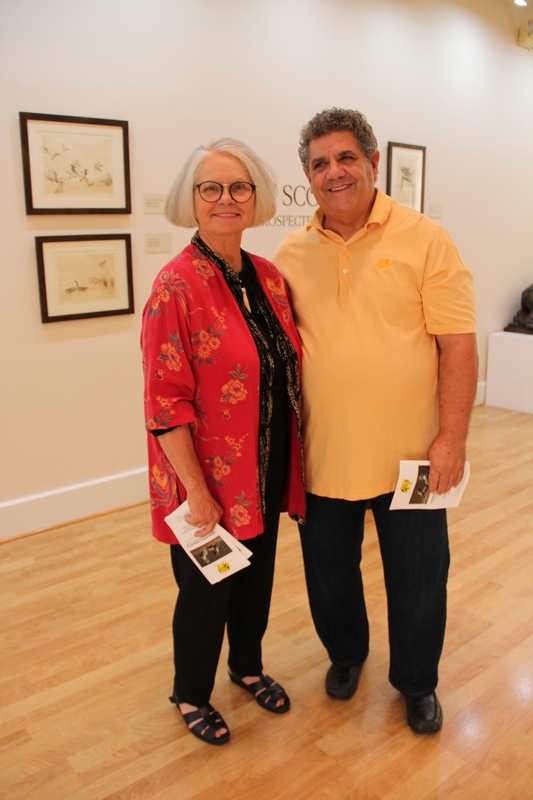 Engage your family in the arts by attending a Free Family Activity Day offered for children and adults at the Center for Visual Arts Bonita Springs. Families will enjoy a quick guided tour of this fun and educational exhibition and complete art projects. Family activity dates are Saturdays from 1:30-3:30 and will be held October 3 &17, November 7 & 21, December 5 & 19, 2015. SANDY SCOTT: A RETROSPECTIVE is a major traveling museum exhibition produced by David J. Wagner, L.L.C. Serving as Curator/Tour Director is David J. Wagner, Ph.D. The exhibition is graciously sponsored by The Sansom Foundation and SWFL Arts & Attractions Grant. Those who join the Centers for the Arts for the first time as an individual member receive two free tickets to a Live at the Center Performance. The Centers for the Arts offers this benefit for first time members and it is for a limited time only. Some performances are not included in this promotion and promotional seating is limited. A full listing of classes offered at the Centers for the Arts Bonita Springs is available at http://www.artcenterbonita.org or by calling 239-495-8989.